Resins are compounds that are used to patch, fill and join surfaces and contain a high degree of adhesive properties that enable them to form a solid patch upon drying. World over they are used in industries, construction, automobiles etc. Within your home-you would be using a resin to fix a leaking pipe or join your broken furniture. Resins are also used in the manufacture of polymers and plastics and are also used in varnishes. Resins are primarily sourced from natural sources such as the sap of certain trees which form a solid mass upon drying. However, within the last century, there has been an increased production of chemical resins which are called as synthetic resins. Not only are they more easy to manufacture, but are also more sturdy then natural resins and can be used on a vast variety of surfaces. However, as with any chemical product, particular art hose engineered for a special need, there is always a danger of the pollution it causes while being used or produced. Also, the product can be at time harmful to heath. Let’s look at some Eco-friendly alternatives for resins. Eco-green resins is a manufacturer of Eco-friendly resin and putty which is deemed as a green resin solution for a variety of needs. Eco Green Resins, LLC based in Nevada was founded by Arthur Katzakian, Craig Katzakian and Brandon Newell. Their products are used in diverse applications such as for desalination of salt water, household and industrial uses and many more. Their flagship product Eco-green resin is sourced from vegetable oils and natural sources, and does not contain any harmful chemical constituents. It has 43% bio-content and comes with minimal shrinkage in normal uses. It can be used for Composites, Coatings and also as an adhesive and a sealant. It does not contain substantial amounts of VOC’s and is virtuallynon-toxic. 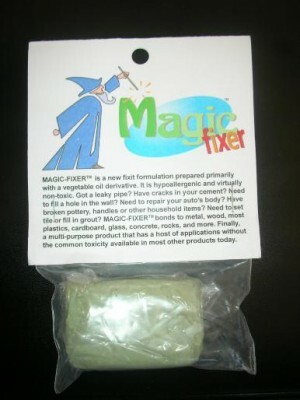 Do also check out Magic Fixer repair putty which is an epoxy system that can bind metal, plastics, cardboard, glass, wood and other such materials. The putty can be used in your house to fix broken pipes, furniture, crockery etc and can also be used in industrial uses and in automobiles. You can purchase them online from their site in handy containers beginning from 24 oz kits. Free shipping is offered within USA. Over seas customers can directly contact them for orders outside USA.